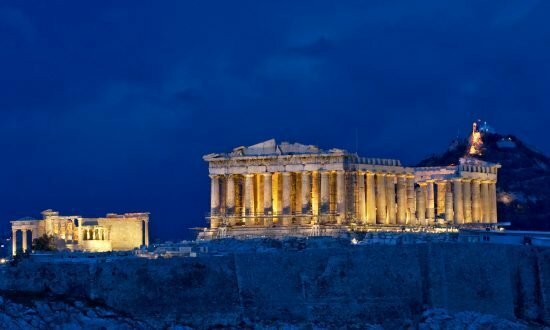 Greece has a fine claim to creating Western civilization with its rich history in politics, philosophy, history, the arts, medicine, trade and sportsmanship. 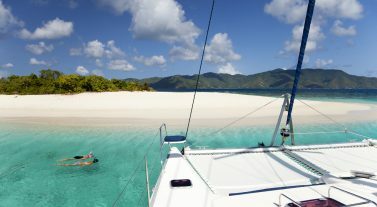 It’s the perfect sailing destination with thousands of islands, laid back culture, delicious food and beautiful beaches. 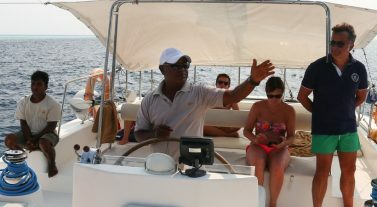 Get a free quick quote and plan your Greek island hopping charter adventure. Enjoy the warm Mediterranean climate and stroll pretty villages dotted with white houses against turquoise waters that shimmer under the bright sun. Sail from Athens to explore the Saronic Islands or from Lavrion to discover Santorini, Ios and Serifos. 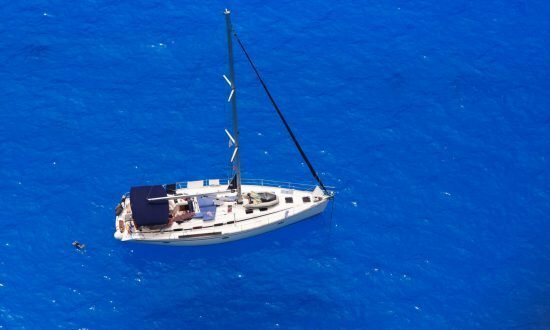 From Corfu, Lefkas and Preveza you can sail to Paxos, Zante and Kefalonia within the Ionian island chain, or make for Skiathos and onwards to the Sporades. For the Cyclades, start your charter from our bases in Paros and Mykonos, or fly to Rhodes and Kos to charter the Dodecanese Islands. 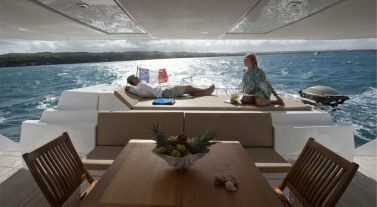 Dream Yacht Charter in Greece: We have bases in Athens, Lavrion, Corfu, Lefkas, Skiathos, Paros, Rhodes, Mykonos and Kos and our friendly teams will look after you, giving local tips and advice. 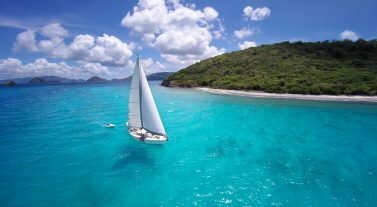 For bareboat charters, convenient day sails can be made to other islands from our bases, and you’ll feel like all of Greece is at your fingertips. If you need help planning your charter, check out our Inspirational Itineraries section or get in touch with our team to find out more. Lavrion, Mykonos and Paros: The prevailing wind Meltemi blows from the north during summer, peaking in July and August at Force 5 to 7, occasionally reaching Force 9. During spring and autumn, winds can also blow from the south. Day 1: At Lavrion Port, settle on board and overnight, dining locally. 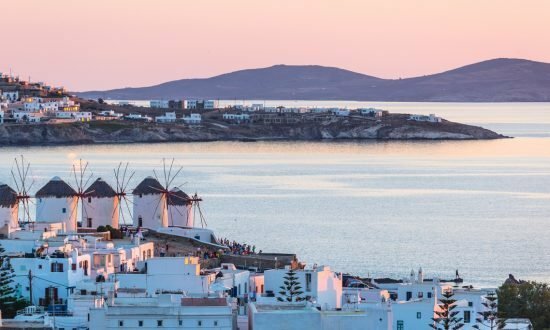 Here’s our guide to some of the 220 islands in this archipelago, although you could swap in Mykonos and Andros as great alternatives. Day 2: Sail to Vourkari, Kea Island, to avoid the tourist hoards and explore the island’s wild beaches and relaxed, rural ambience. Try sandy Liparo and pebbled Kampi, or Spathi. Kea is the region’s top scuba diving spot, especially for wreck diving. The sister ship of the Titanic, Britannic, as well as Burdigala, Patris and a German ocean liner are nearby. Day 3: Make for Finikas, Syros Island, and also discover the impressive architecture of Ermoupolis with its colorful buildings rising up into the hills. Stroll along the smart waterfront framing cobalt waters or head for the beaches on the west coast, such as Galissas and Poseidonia. 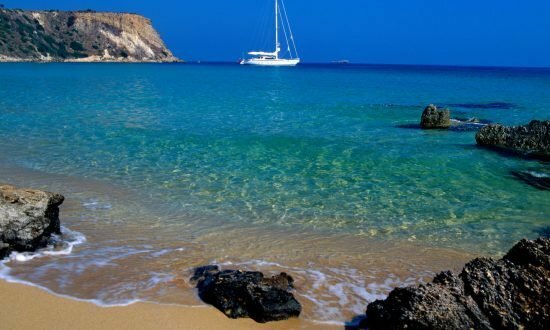 Day 4: Head to Parikia, Paros Island, for swimming and sunbathing. Kolymbithres in the north has spectacular granite rock formations, or head for Piperi beach, Molos and Chrissi Akti. The nightlife is fun and you’ll find plenty of water sports on the island. Day 5: Set off for Kamares, Sifnos Island, and onwards to the gorgeous bay at Vathi. The best beaches are on the south coast, including Platys Gialos’ long stretch of sand. The island is known for its ceramics and you can buy pieces from workshops. Try the traditional food, especially chickpea soup and fritters. Day 6: Make for Loutra, Kythnos Island, known for its healing mineral springs, and you can book in at the local spa and try its thermal baths. Don’t miss Kolona beach, a sandbank connecting the island to Agios Loukas. Day 1: Board at Marina Gouvia, Corfu, the perfect place to start your adventure of the Ionians with its seven main islands. Visit Kérkyra old town and get acquainted with its Venetian influence or Kanóni for its beautiful views. Day 2: Head to Gaios on Paxos Island and onto Erimitis beach on the west coast, where you can explore fantastic blue caves nearby. Head to Antipaxos to swim turquoise waters that wouldn’t look out of place in the Caribbean. Day 3: A highlight is the busy town of Nidri on Lefkas Island, where you can find traditional dining at Fistaria grill houses, or relax with a 40-minute hike to the Rahi Waterfall. You can take in the great view of the bay from Nidri and gaze at the Ionians standing proud in the Ionian Sea. Day 4: Hop over to Vathi at Meganisi and you will find beaches that are only accessible by boat too, which means they are less crowded. Try Fanari, a pebbled beach with clear waters, or Megalo Limonari. Day 5: Swim at Lefkas Island’s fantastic beaches. To the west, you’ll find a long sandy stretch at Agios Ioannis that is popular with windsurfers. Other notable beaches include Porto Katsiki, with its dramatic cliffs, and sandy Pefkoulia. Day 6: Explore the uninhabited isles of Sivota and Agios Nikolaos and the fishing village at Mourtos Marina on the mainland. If the marina is busy, try the anchorages at Monastery Bay and Sand Bar Bay. Day 1: Marina Mandraki at Rhodes is a wonderful base for a sail around the Aegean Sea and the hundreds of islands in the Dodecanese archipelago. While at our base, enjoy the local atmosphere and get to know Rhodes’ preserved medieval town. Day 2: Sail to Simi Town and take in its pastel-colored architecture which make up the waterfront. The sands at Nos are close to the main port, while Panormitis beach is less touristy. To shelter from winds, head to Emporio cove. Day 3: Palos (Nisyros Island) is a great place to stop off for inland exploration, particularly the active volcano and impressive caldera. Stroll dark, volcanic beaches, such as Gialiskari and Pahia Ammos, or Mandraki’s white washed streets. 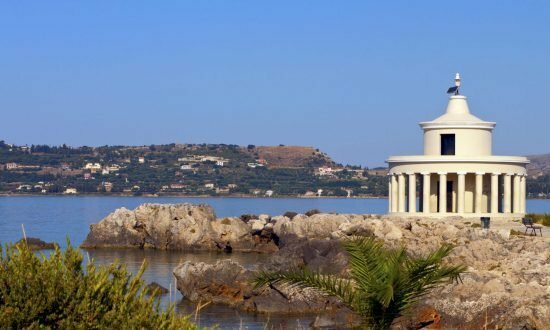 Day 4: Enjoy the medieval fortifications on Kos Island, including the impressive turrets belonging to the Castle of the Knights of St. John on one side of the harbor. For sandy beaches, sail to Kefalos, Marmari and Tigaki. Day 5: Relax at Tilos Island’s Livadia port and enjoy an ice-cold coffee in the bars or dine at the tavernas. Visit Kryas Springs or head inland to look around an abandoned village. Enjoy the secluded beach at Agios Antonios Marina, but watch the rocks, or swim in the clear water at Eristos. Day 6: Enjoy a cool drink at Nimporio’s waterfront on Halki (Chalki Island), where you’ll be met with a warm welcome. Find a gently shelving beach with free sunbeds at Kania Beach, shallow waters at Pondamos and a rocky coastline for snorkeling at Ftenagia. Try Yiali beach for a bit of isolation, which is only accessible by boat. Day 1: Sail from Marina Skiathos and into the heart of the Aegean and the Sporades archipelago. Before you go, don’t miss the southern coast of Skiathos and its sandy beaches, such as Lalaria, which is only accessible by boat. You’ll also find endless options for tasty food and cool drinks on the waterfront. Day 2: Discover your inner Abba fan and sing-a-long to classics on Skopelos Island, the setting for the film Mamma Mia! Hop between Skopelos Town and Glossa, with its white houses winding into the hills, or swim at Panormos and Agios Ioannis. Day 3: Make for Linaria on Skiros Island and enjoy the beach at Acherounes or dine at the tavernas. Find some peace at Molos with its long sandy beach, where you can find a quiet spot. From here you can see the town of Skiros snaking up the imposing rock face. For a beach even less crowded, sail towards Kareflou. Day 4: Hop to Kira Panagia Island, after sailing through the National Marine Park with its endangered Monk seals. Plantis Bay is a natural harbor where you can moor. On the east coast, you can see the monastery, which is inhabited by a single monk, and the remains of a basilica. Day 5: Patitiri is the main port on Alonnisos Island, where you can find cafes and restaurants. Sail for Leftos to dine at the taverna in the olive grove and swim in clear waters. For relaxing sands, head onto popular Chrisi Milia beach with its tree-lined rocky backdrop. Day 6: Koukounaries on Skiathos Island is framed by pine forests and is a popular beach with a long sandy stretch. Relax on your last day with a swim and sunbathing, or try your hand at some water sports. Day 1: Set off from Alimos Marina (also known as Kalamaki Marina), the largest marina in Greece with restaurants, snack kiosks, telephones, toilets and showers. Don’t miss the sights at Athens before you sail. Day 2: Head to Epidauros Marina on the north eastern Peloponnese coast in Argolis and explore the huge 4th century amphitheatre with its impressive, intact stadium, rising up in perfect symmetry. This ancient ruin, together with Mycenae, are important archaeological sites in Greece. Make sure you snorkel the sunken city of Epidauros to see ancient underwater ruins. Day 3: Sail over to car-free Hydra Island, named after its natural springs by the ancient Greeks. Get to know Hydra’s main town and the artist community. Most of the island is wild and perfect for hiking. Or dive at Bisti, swim at Mandraki and enjoy the sands at islet Agios Nikolaos. Day 4: Spetses Island has a strong naval history and you can see its influence among the architecture of the captain mansions. The beach at Agii Anargiri is one of the largest on the island with Berkiris’s cave at one end. Agia Paraskevi beach is popular with its green-topped rocky backdrop, flanked by a whitewashed church and sandy beach. Day 5: Head to Galates, opposite Poros, to stroll the forest which is home to thousands of orange and lemon trees. At Poros waterfront, climb the hill to the clock tower for a great view of the bay. You’ll be spoiled for choice when it comes to beaches, so try Love Bay, Askeli and Monastery. Day 6: Make for Aegina Island, a popular destination with native Greeks. Explore the ancient ruins at the Temple of Aphaia and the Temple of Apollo at Kolona, where you can get a great view too. You can also island hop to nearby islets of Moni and Metopi. Our Athens Base Manager, Stelios Michas (Mob: +30 695 1940401, office tel: +30 210 9850129, technical assistance: +30 694 8235179) will be pleased to welcome you on arrival. Our base is at Vernicos Yachts, Alimos Marina (also known as Kalamaki Marina), Pier 3, the largest marina in Greece with restaurants, snack kiosks, telephones, toilets and showers. Our Lavrion Base Manager, Vassilis Kirikinis (Mob: +30 694 4949578) will be pleased to welcome you on arrival. Our base is at Vernicos Yachts, Lavrion Port, on the L-shaped mole in front of the yachts. Our Paros Base Manager, Kastanas Yorgos (Mob: +30 6944 209624, Tel: +30 22840 23625) will be pleased to welcome you on arrival. Our base is at Afros Yachts, Parikia Port, above the marina cafe. Our Mykonos Base Manager (see Useful Downloads for more information) will be pleased to welcome you on arrival. Our base is at Tourlos Marina, on the L-shaped mole in front of the yachts. Fly to Mykonos International Airport via Athens International Airport Eleftherios Venizelos (ATH), Greece, direct from New York with Emirates or with scheduled stops from San Francisco, Los Angeles and Chicago with American Airlines. We can arrange airport transfers on request to our marina, which takes about 20 minutes by taxi. Make sure your passport is in date and valid for the duration of your stay. Visa advice can be found under our Handy Info section. There is a supermarket 20 minutes from the base, open Monday to Sunday. You’ll find tavernas, restaurants, bars and cafes within walking distance of the marina. Our Corfu Base Manager, Paitaridis Thanassis (Mob: +30 6932 404935, Tel: +30 26610 99507) will be pleased to welcome you on arrival. Our base is at Vernicos Yachts, Marina Gouvia (north entrance), in Gouvia Bay, Kontokali. Our Lefkas Base Manager, Aris Choutopoulos (Tel: +30 2645 022103) will be pleased to welcome you on arrival. Our base is at Vernicos Yachts, Lefkas Marina, Pier G, above the Remezzo cafe. We can help you moor on your return. Our Rhodes Base Manager, Fotis Organos (Mob: +30 6945 088890) will be pleased to welcome you on arrival. Our base is at Vernicos Yachts, Mandraki Port, on the east mole near the windmills. The harbor is just below Rhodes’ ancient castle and opposite the market square. Our Kos Base Manager, Michalis Kanalis (Mob: +30 (697) 3747231) will be pleased to welcome you on arrival. Our base is at Vernicos Yachts, Kos Marina, on the first floor of the marina building above the coffee shop. Our berths are on Pier F.
Our Skiathos Base Manager, Minas Zeppos (Mob: +30 (697) 0924710) will be pleased to welcome you on arrival. Our base is at Skiathos Port, but head to Meltemi Cafe on arrival.